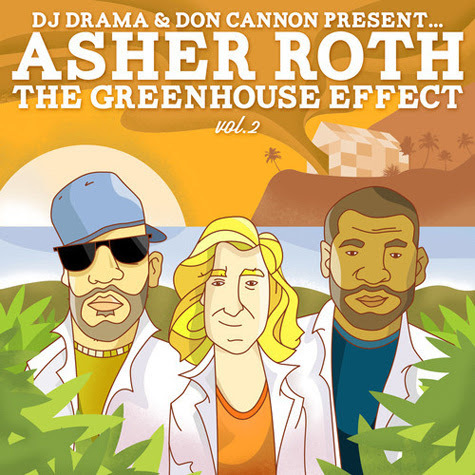 Five years after The Greenhouse Effect, which featured the unforgettable remake Roth Boys, Morrisville PA native Asher Roth released the sequel to his highly succesful 2008 debut mixtape. The Blonde Bob Saget, probably best known for boozy party anthem I Love College from his 2009 debut album Asleep In The Bread Aisle, has quietly been putting out quality music, despite being stuck in A&R limbo for the last few years. Leading up to the release of GEV2, Asher wrote an open letter to XXL to discuss his sobering experiences in the music industry. "I had become lost in the entire transition," he writes, "Wrong place. Wrong time." Asher Roth will not fall victim to A&R hell again. "I prefer to relay my music directly to my fans. Show them what it is I see. Share with them what I think it is." 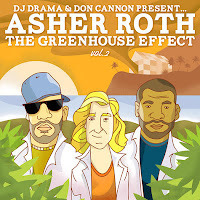 The outcome is The Greenhouse Effect Vol. 2. GEV2 is a celebration of fun and freedom, as Asher proves that he is indeed a rapper and not a frat-rap gimmick. His raps are clever and unforced, and, even though no serious topics are discussed on GEV2, Mr Roth captures your ear and doesn't let go.